The changing of seasons brings so much joy! The first signs of spring offer a relief from winter temperatures, as well as longer days and blooming plants. And…an opportunity to wear lighter fabrics and brighter colors! Just as I love snuggling up in my knits and layers as soon as the leaves fall from the trees, I am just as eager to pull out my sandals and wear brighter hues when the birds first start chirping. In the spirit of spring, I thought that I would style 2 key spring trends this year: floral prints and nautical stripes. Who are we kidding?? These continue to be critical spring trends each year and this spring is no exception! 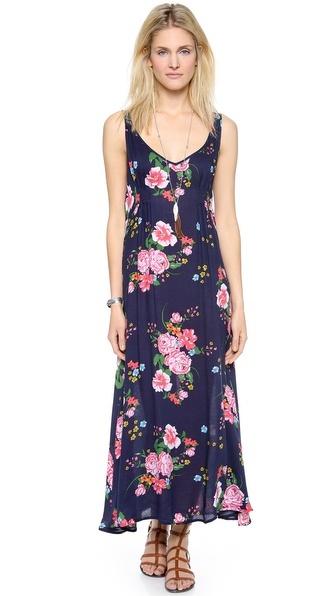 I’m loving this floral print on a classic spring favorite: the maxi dress. The dress has a beautiful scoop back, perfect to show off a lacey bra. And, what spring look would be complete without the addition of a panama hat? Option 2: Layer a cropped sweater over the dress and add a heeled shoe for a dressier, yet still laid-back, look. I have seen this jacket on multiple shopping trips. I love how the moto styling contrasts with the classic preppy navy and white stripes. There are so many pairing choices, it was difficult to select just two! Outfit 1: Layer the jacket over a classic navy dress and add a punch of color with a bright shoe. This look is office-ready yet fun. Outfit 2: Dress-up a casual message tee and distressed jeans by adding the jacket and a pair of colorful patterned espadrilles. I’m off for a weekend of fun, if no sun! A girlfriends weekend away in Orange County…with a forecast of heavy rain. Lots of chat, champagne…with some shopping too. No rays required. I am not particularly fond of taking and editing photos of myself. And…I also happen to be married to my amateur photographer. We take pictures either during nap time or while children are scootering. So, in an effort to demonstrate how versatile a camo print can be, we put a helmet on my 3 year-old and hit the pavement in search of a good spot. My photog then suggested some greenery in the background, and I willingly climbed in amongst the bushes (note: I am wearing Wellies). 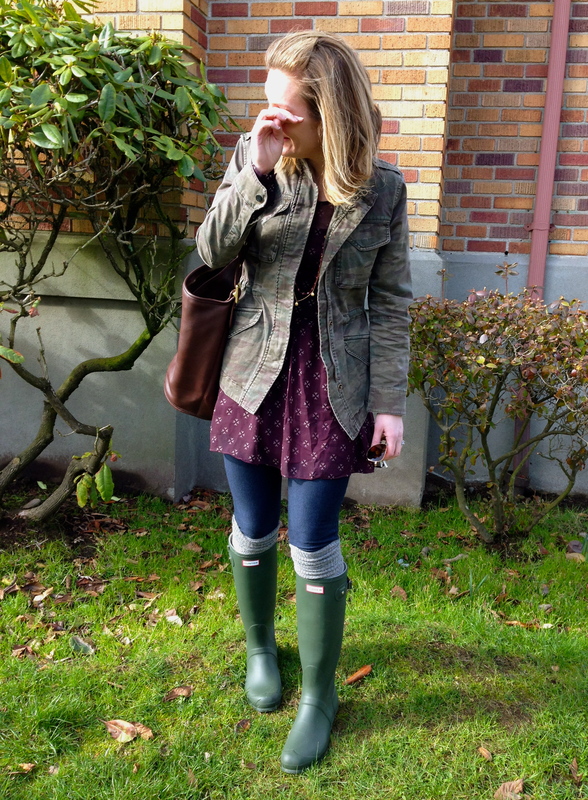 As you can imagine, laughter ensued as he pointed out that I was standing in a planter…wearing camo. Let’s talk about camouflage for a moment. As stated in my post earlier this week, this print is subtle enough to be worn as a neutral; complimenting most any color, even when paired with another pattern. 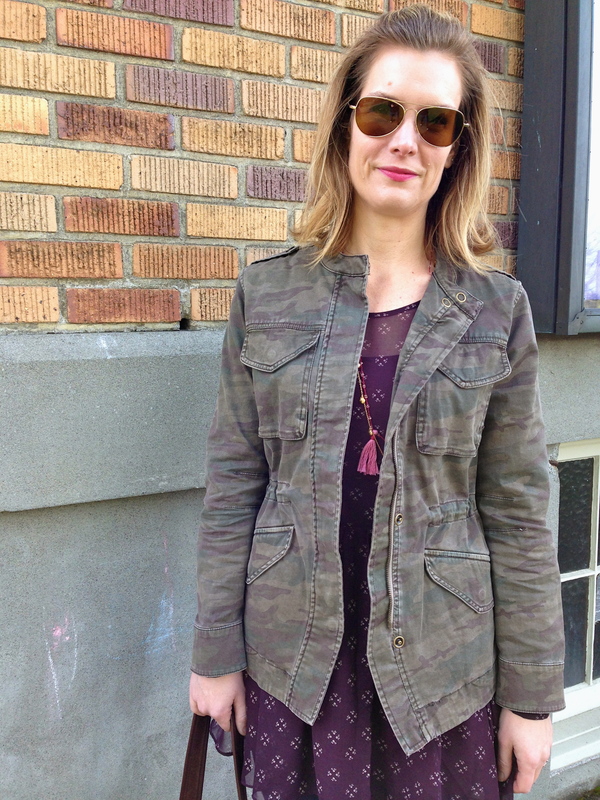 In this outfit, I used the neutral color and military styling of my jacket to contrast a rather girlie dress. One fun thing about fashion is mixing unexpected items together to create interest and make your outfit unique. As mentioned, the styling of the two pieces differ in this outfit as well as the mix of texture – the jacket is canvas and the dress a sheer chiffon. Accessories are the finishing touch to any outfit. Here I layer a couple of long necklaces in an effort to draw the eye down from the higher neckline of the dress. 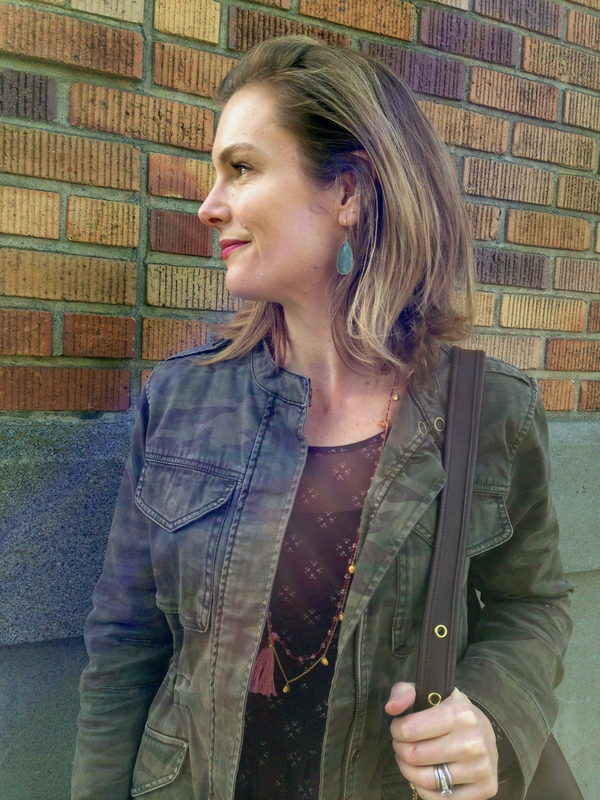 Finally, I chose turquoise drop earrings, which add some brighter color yet still compliment the neutral tones of the jacket and the burgundy dress. 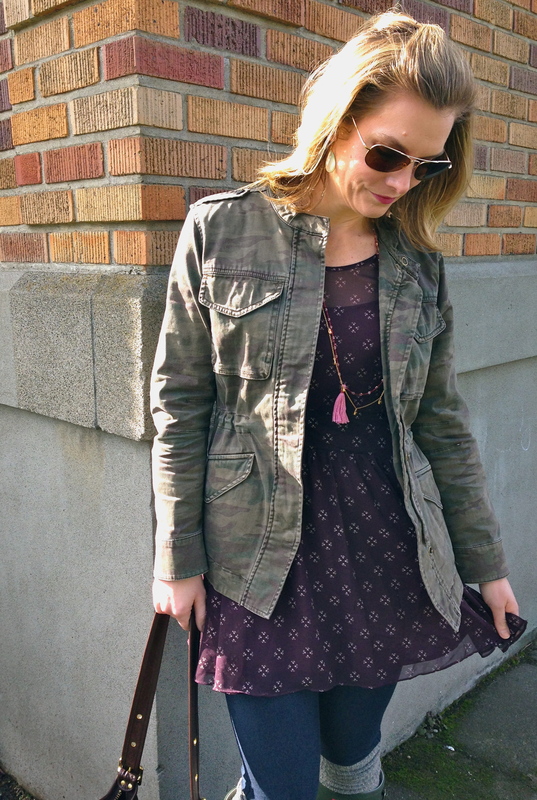 Jacket: Sanctuary | Dress: Free People (sale!) | Leggings: Madewell (similar) | Socks: Free People (similar) | Boots: Hunter | Purse: Coach (vintage) | Necklaces: Stella & Dot & my own | Earrings: Lucia K (not available) | Sunglasses: SALT. Thanks for reading! Please click to follow if you would like to be notified via email when I add a post. And keep the feedback coming! What would you like to see? Next week “I’m Lovin'” resort wear (reader request). What I’m Lovin: Is Camo the New Leopard? Dare you try a leopard print pant? In a subtle black on black print, the leopard adds some interest but isn’t the focal point of the outfit. I own these pants (surprise!) and I wear them as I would a pair of black jeans. However, you could do the same with the camo pants on the right. Cool when paired with a simple tee and converse or dress them up with a colorful silk top and a pair of high heels…oh, and a slouchy blazer! The aforementioned leopard ballet flat is a staple; however, a leopard print sneaker?? Yes, please! But, check out these awesome camo print flats. This print definitely add some subtle edge to this lady-like classic. Accessories are a simple and more understated way to adopt a new trend and/or a print. Try a scarf, belt or bag in leopard or camouflage and add some spark to your outfit. As for the classic leopard ballet flat, these are my all-time favorite. 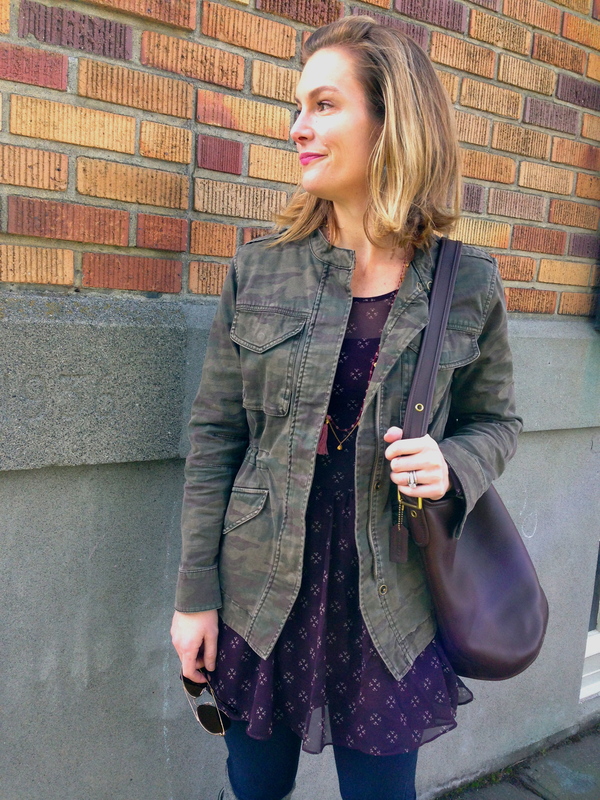 I spent a lot of time finding just the right pair: a perfect-size print, in calf hair; goes with everything from jeans to pencil skirts, from black to navy to taupe. A little spendy but worth the investment (and now on sale!). A leopard flat remains a wardrobe must-have. Thanks for reading. And, please keep the feedback coming! What’s your favorite print? Do you prefer leopard or camo?? In the spirit of “practicing what you preach,” I am posting several outfit shots of my white jeans. Also, my husband advised me that I should probably post a few pics of myself…to assure my readers that I’m not some creepy dude half-way around the world (he used a more colorful description that I have censored). Black can be harsh in contrast to a white pant (there are exceptions, like an entirely black and white outfit). Therefore, the taupe bootie were an easy pairing choice and also kept my entire look in the white and taupe color family. The rose/taupe hue of the sweater and the browns and grey in the scarf compliment the ensemble. 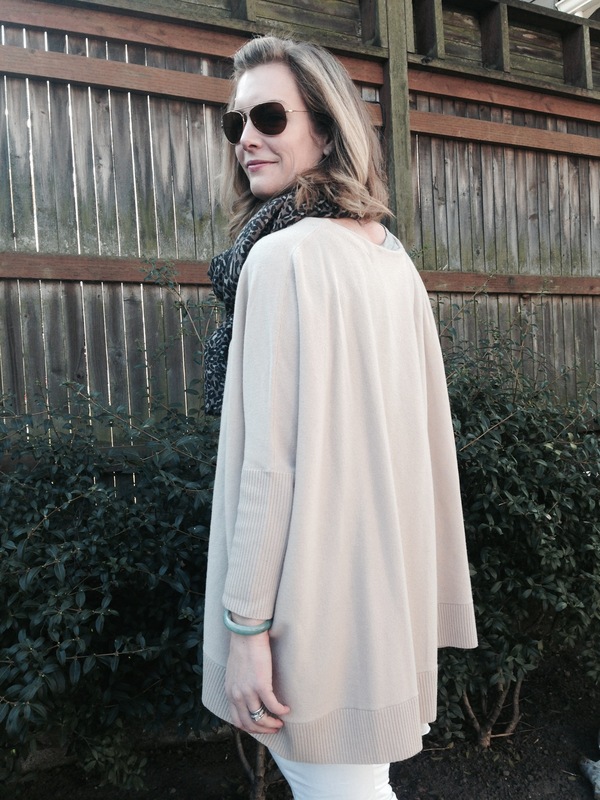 So sorry about the poncho being sold out (I almost feel like I am bragging). This is a Nordstrom Anniversary Sale find from 2012. More on this as the annual “holiday” draws near, but I use this sale as an opportunity to buy luxury pieces that would normally be out of my price range (think Rag & Bone booties, an Elizabeth & James blouse, and a Mackage leather-sleeve jacket…to name a few recent scores!). Thanks for reading and please keep the feedback coming! What would you like to see more of? Let me know…I’ll take requests (but I reserve the right to censor). I throw caution to the wind with regards to many of fashion’s “rules.” I wear black with navy, mix casual with dressy pieces, never reduce my accessories and I most definitely wear white after Labor Day! 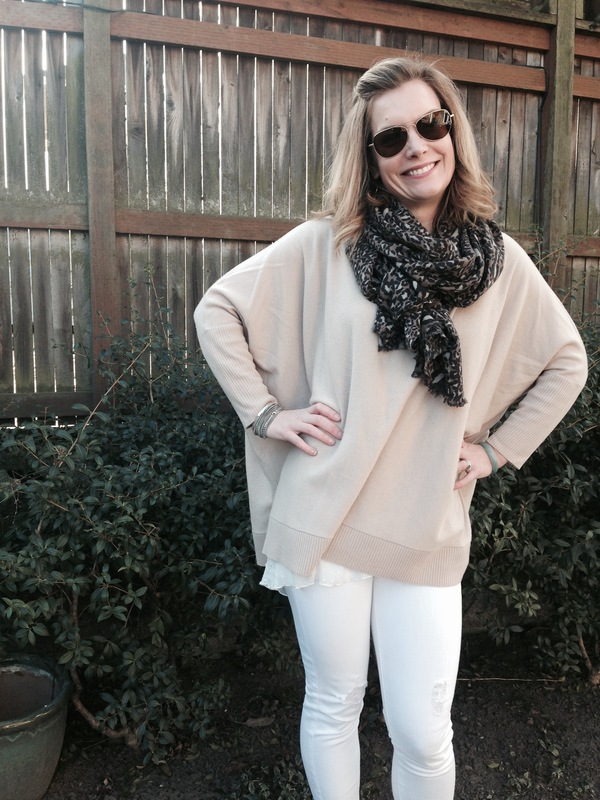 White pants no longer need to be relegated to your storage bin with the changing of the leaves. With a few thoughtful pairing ideas, you can easily enjoy your white pants year-around. 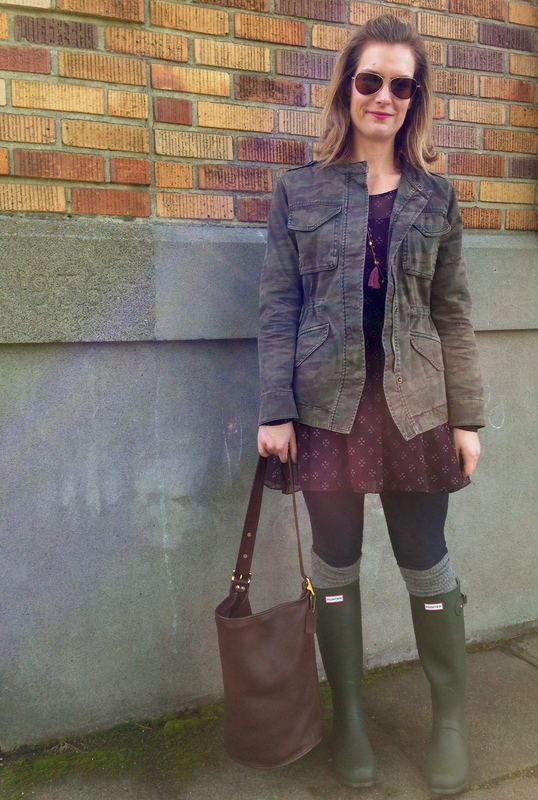 This is a great outfit for brunch, shopping with friends, hitting your local farmers market…the list goes on. Note: I have omitted playing at the park. White jeans are not super kid friendly. However, I fully embrace my current “lifestyle” and wear what I want – dry-clean-only be damned! I am fairly savvy with the bleach…and an absolutely amazing product called Soil Luv (which I have only found thus far in Dollar Stores in California). The key to making this look work in cooler temps is the addition of lots of layers in varying patterns and textures. 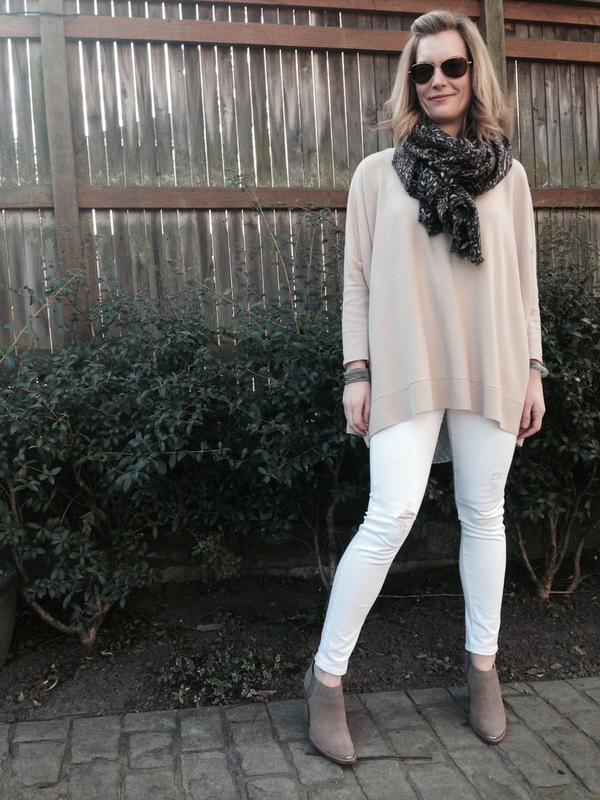 Then add a neutral bootie and you can sport this outfit throughout the year. This look is office friendly and totally chic. Just stay away from the coffee maker and dry erase pens! Also, when wearing wide leg trousers, be sure that the hem of the pant is just skimming the floor (this will allow you to maximize the leg-lengthing benefits of this cut). The addition of some metallic accessories and a punch of pattern with the bag make an all-white outfit more interesting yet sophisticated. The key to a monochromatic look such as this one is varying the texture of your matching pieces; the wool-blend trousers and the silk top. Although they are the same color, the different textures delineate the two pieces and add visual interest. This look is seriously rock n’ roll – so fun and playful; the perfect mix of notice-me elements and seriously chic pieces. You could easily wear this outfit for a night on the town: a concert, party or out with the ladies. In particular, this outfit is an interesting dichotomy between casual (the destroyed jeans and tee) and dressy (the fur vest and high heels). Since the fur vest is such a statement, keeping the other accessories fairly neutral allows this special piece to be the focal point. Both the shoes and the vest are more of a blush white, which pair nicely with the stark white of the jeans. You can vary the tones of your white pieces as long as it looks purposeful, meaning that the pieces are noticeably a different shade of white. So dust off your white pants and bring them back into the rotation. 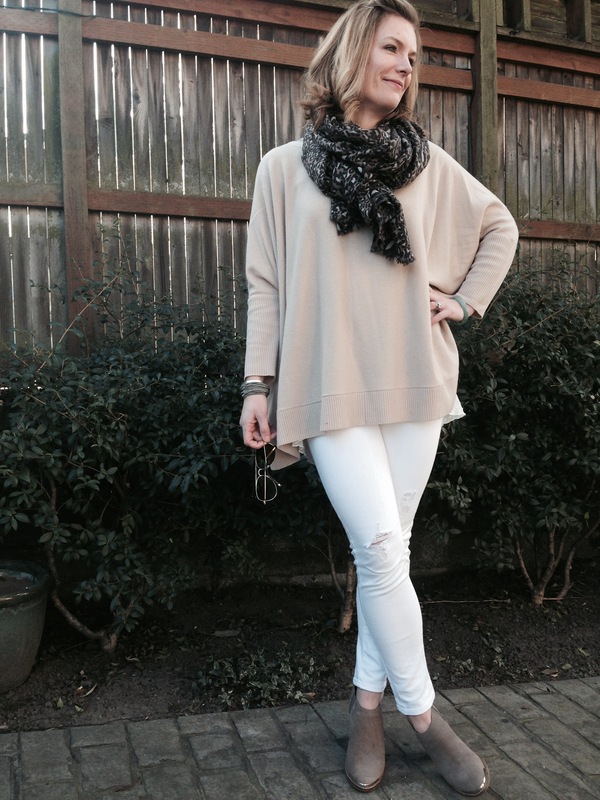 Let me know your favorite way to wear white in winter and please keep the feedback coming!